Last visited by Keeshi – April 18th 2000 I was looking through my runes this eve when I came across one for a tavern called the Wandering Wisp. Always one to enjoy a good ale and perhaps a tale or too I at once headed out to take a look at the place. I was amazed to see that not only was it a tavern, but in fact an entire town had popped up there. I was met by the Mayor of the town, a lad by the name of Wolf, and a few of his guild members. It was quite a lovely little tavern, with booze a plenty and kindly folk who where more then happy to lend a hand to those who ask for aid. 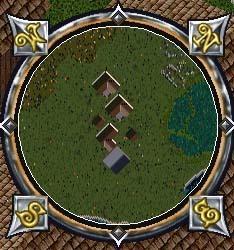 The town is located just SouthEast of Leiah’s Rune Library, South of Trinsic. Most of the building in the area are public even those owned by members of the guild. Unfortunately as I arrived the town had aquired some new neighbors, all of which were murderers. Luckily they didn’t come out to bother with us and the guided tour I was given was quite nice. 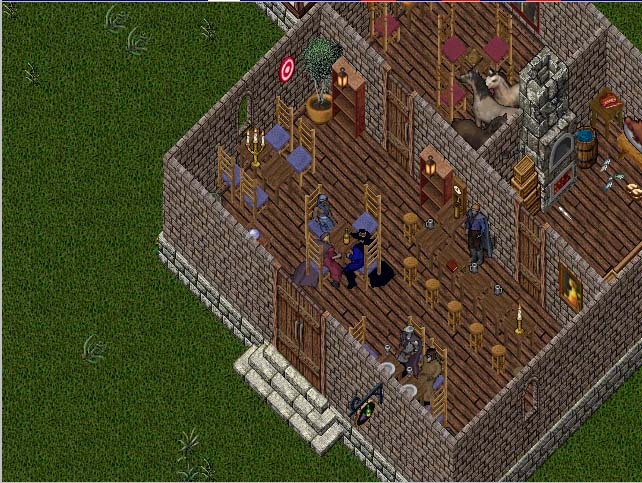 The town offers a variety of shops including: Woodworks (carpentry), Arms & Armor, General Store, Mage Shop, Tailor Shop, a Rune Library, along with a guild hall, town hall and a building known simply as the Treasure Chest. The primary building however is the Wandering Wisp. A tavern of both decent size, and pleasing decour.